This week's East Coast blizzard could be the biggest on record. The coming storm will make this image, from February 2014, look positively summery. After a relatively snow-free winter so far, a major blizzard is set to bring parts of the Northeast to a standstill early this week. The National Weather Service (NWS) in New York City is calling the potential for epic snowfall “historic,” while the Boston office says the incoming storm is a “textbook case for a major winter storm/blizzard.” Three-day snow totals could reach 24–36 inches in each city—good enough to rival the biggest Northeast snowstorms on record. This week’s storm has the makings of a record-breaker in New York City. Since 1869, the biggest single storm on record was 26.9 inches in 2006. That kind of forecast is jaw-dropping, even for the most jaded meteorological aficionado. Blizzard warnings have been posted from coastal New Jersey to Maine, including New York City and Boston. “Blizzard” is actually a technical meteorological term that requires near-zero visibilities and sustained winds or frequent gusts exceeding 35 mph for at least three consecutive hours. These criteria are typically met in the Northeast only once every few years. The Boston NWS office warns “travel may become impossible and life-threatening.” If the storm comes as forecast, it would be enough to temporarily cripple the region. In its latest update Sunday afternoon, the New York City NWS office said to expect gusts up to 50 mph in the city, with brief gusts up to hurricane force on Eastern Long Island. Wow. 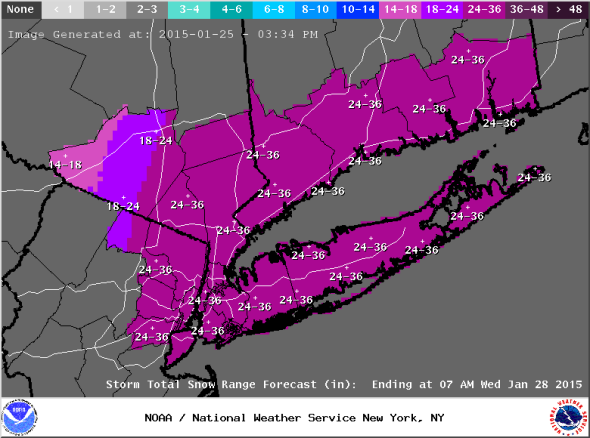 The latest snowfall maps show a 50-50 chance of New York City’s biggest snowstorm on record. Expect one to three feet of snow plus near whiteout conditions from Philadelphia to Maine. For snow lovers, this is the stuff of legend. For everyone else, it’s a time to take a deep breath and prepare to ride out a whopper. If you find yourself stuck at home this week, hyperbole aside, take solace in the fact that it’s very likely no one has experienced a storm quite like this for centuries. 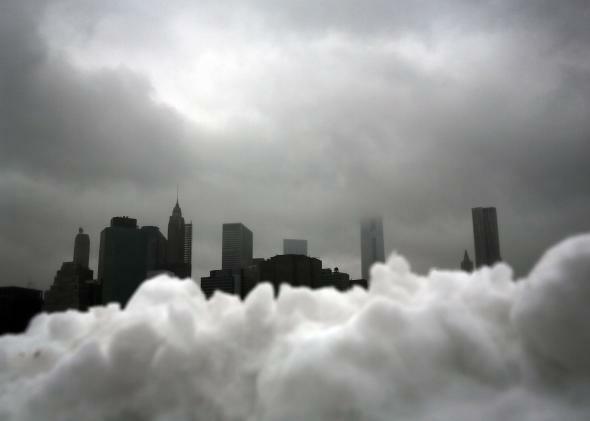 I mean, New York City could break its all-time snowfall record for a single storm by 10 inches. What’s making this particular storm so potent? In sharp contrast to last week’s nor’easter, there’s no shortage of cold air this time around. A blocking high-pressure system to the north will slow the storm’s advance to a crawl—with the center spending up to 24 hours just off Long Island—right as it is peaking in strength. Combine that with a roaring, perfectly kinked jet stream, and you have all the ingredients for an explosive storm that will reach “bomb” criteria, funneling Arctic air southwards and converting it into a thick blanket of wind-whipped white. All the extra cold air may also boost snow totals, because “drier,” colder snow is up to 50 percent fluffier than “wet” snow that falls with temperatures nearer the freezing point. Very strong winds should create drifts the height of humans. The NWS in Boston expects “pockets of thundersnow” during the overnight hours late Monday. All this means there’s very little chance of a bust. An experimental probabilistic snow forecast by the NWS shows a 67 percent chance of at least 18 inches in New York City. In Boston, the odds are 75 percent. I don’t know about you, but that’s seems good enough to invest in a snowblower. WPC uploaded new Percentile snow data files ... totals for median now are outrageous. This is going to be an epic week for weather nerds (myself included). No but seriously, the amount of weather geeks foaming at the mouth over this is insane. It's like y'all got the snow rabies. A reverse trajectory model shows a Siberian weekend in store for New York City. The suddenly very active weather pattern may produce yet another snowstorm on Thursday night, with at least two major blasts of frigid Arctic air plunging Northeast temperatures to near zero Fahrenheit this weekend and next week. The air that’s set to comprise Saturday’s atmosphere over New York City is now somewhere over Eastern Siberia.